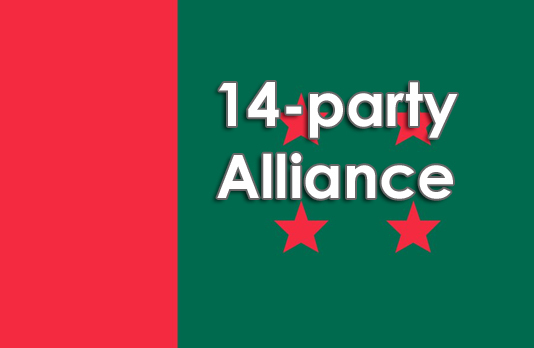 Awami League (AL) Presidium Member and 14-party alliance spokesperson Mohammed Nasim on Saturday said the alliance will form joint teams to conduct campaigns across the country ahead of the 11th parliamentary elections. “We will form joint teams for conducting election campaigns in different constituencies by organising meetings and rallies to encourage the people to vote for the alliance’s candidates,” he said, after coming out from a meeting of central 14-party alliance at AL’s central office in the city’s Bangabandhu Avenue. Gano Azadi League president SK Shikder presided over the meeting. Bijoymancha (victory stage) will be set up at all upazilas and districts across the country on December 16, Nasim, also health and family welfare minister said, adding on the stages songs will be rendered and dramas staged on the country’s Liberation War. Mentioning that, BNP and Jamaat are afraid of the month of victory (December), he said, adding: “Oikyafront demanded deferment of the parliamentary polls. They do not want election in December, the month of victory. They become afraid when December comes”. Attack on police in front of BNP central office in the city’s Nayapaltan is a sorrowful matter, Nasim said, adding BNP’s character has not changed yet. “It was a pre-planned attack. They (BNP) were ready with sticks for carrying out the attack. But they are now spreading falsehood over the incident,” the AL leader said. Jatiya Samajtantrik Dal (JASAD) President and Information Minister Hasanul Haq Inu, Workers Party of Bangladesh (WPB) General Secretary Fazle Hossain Badsha, Samyabadi Dal General Secretary Dilip Barua, JASAD General Secretary Shirin Akhter, Awami League (AL) Organizing Secretary Khalid Mahmud Chowdhury, Relief and Social Welfare Secretary Shree Sujit Roy Nandi and Deputy Office Secretary Barrister Biplab Barua, Jatiya Party General Secretary Sheikh Shahidul Islam, Dhaka City South unit General Secretary of AL Shahe Alam Murad and Joint General Secretary Dr Dilip Ray joined the meeting, among others.